Categorized as: Girls & women, Grantee, Job Creation, Latin America, Our Partners, Poverty Alleviation, Stories & Tagged as: Ecuador, Microloans on September 18, 2016. Related Grantees: Firelight Foundation, Grameen Foundation, Save the Children, Working Capital for Community Needs. Editor’s note: Happy 70th birthday to our longtime, deeply valued partner, Freedom from Hunger, whose small staff of less than 50 strives to end hunger through financial empowerment, health and business education, and livelihood development in 23 countries all over the world. Supporting self-help for the world’s chronically hungry poor, many in remote rural areas, has never been an easy mission. Starting off as Meals for Millions post-WW2, they developed a high-protein powdered food supplement that’s still in use today. Read more about Freedom from Hunger’s history here. Through time, they adapted to launch the world’s first integrated microcredit/health and nutrition education program. All along, Freedom from Hunger’s U.S.- and internationally-based staff have combined objective evidence (through random-controlled trials or RCTs and household financial diaries) with deep individual listening to the clients they serve, to discern what’s needed in each village, city, and home. We celebrate their work, which continues to evolve, finding new ways to invest in low-income families (mostly but not all women) to build a life of dignity and choice. Freedom from Hunger supports locally based nonprofits to deliver education in supportive group settings where clients also can save and borrow funds to build up inventory, improve their housing, cover family healthcare costs, and send kids to school. Today, their programs serve over 5 million clients (that’s over 26 million people, counting family members) in some of the poorest countries on earth. Luz pounds reeds into the base of what will become a broom, made from local sustainable materials. 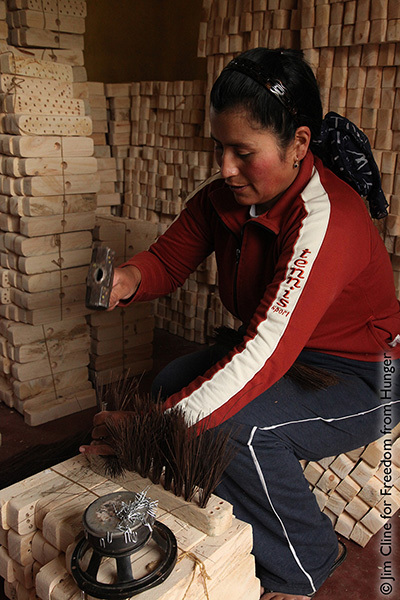 Pasto Alto, Ecuador: Luz America was still a kid when she learned how to make brooms, a skill that would help to launch her into a life-long career as an entrepreneur. As a young woman, she started a small shop in her village working seven days a week, to earn a few dollars for her family. She sold food and household supplies, and grew vegetables for her own family consumption and for sale. As creative as she was, she didn’t have schooling or support to expand her repertoire of income-generating efforts. But when Luz America heard of a new program for women offered by ASOF, a local partner supported by Freedom from Hunger, she was among the first to sign up. Studying business and financial skills, Luz was able to access loans to grow her business; before this, because of her level of poverty (no collateral or bank account) she did not have access to the financial resources or business management skills to grow her business. Now, in addition to the training she had one more essential ingredient for success–she had human collateral: The other members in Luz’s credit group vouched for her loan, and vice versa. They also learned alongside one another how to grow their businesses and save a bit for capital investment and emergencies. And they had each other, a circle of support encouraging each member of the group to believe in themselves and achieve their goals. For the first time, Luz could launch her own venture—a broom-making business using raw materials sourced from the Amazon Basin. Luz began to sell her brooms, along with other products, at her little shop. She expanded her farm, diversifying her crops both for sale and home-cooking use. Her entrepreneurial spirit, backed by Freedom from Hunger’s training, access to financing and support from her group, were all Luz needed to get ahead of hunger. With her newly gained confidence she began to get more involved in her community and became one of the first women elected to a local committee. 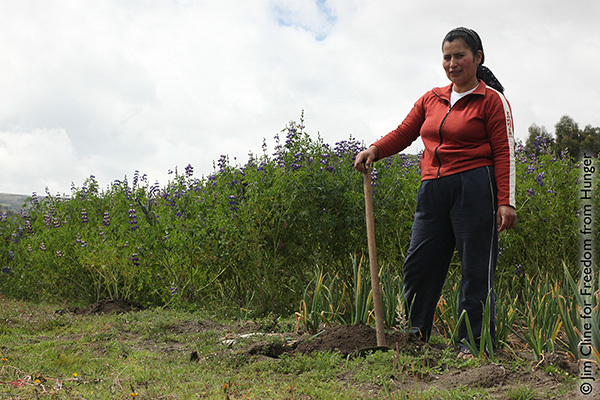 Luz grows crops for her own family’s consumption as well as to sell in her little shop. This corn reaps college fees for Luz’s kids. She still works hard, but now she enjoys a steady source of income. She jokes, “My husband doesn’t always get paid on time or can’t find work, now I’m the one everyone comes to when they need money.” Her children made it through secondary school and have gone on to college—thus ending the intergenerational cycle of poverty into which Luz was born. Now, other women in her community turn to her for advice on running a successful business. Luz gladly offers encouragement and support as they build a life free from hunger and poverty for themselves and their families. Freedom from Hunger has found that combining group education with financial access really empowers clients to build economic and social autonomy. The women learn to set life goals, develop their businesses, earn more income, and set and achieve goals. The women also serve as trainers within their groups which helps strengthen their leadership, group facilitation and public speaking skills. The Mas Mujeres program currently serves 1,000 women. Freedom from Hunger hopes to take lessons learned here in Ecuador and scale support for women entrepreneurs in other countries. 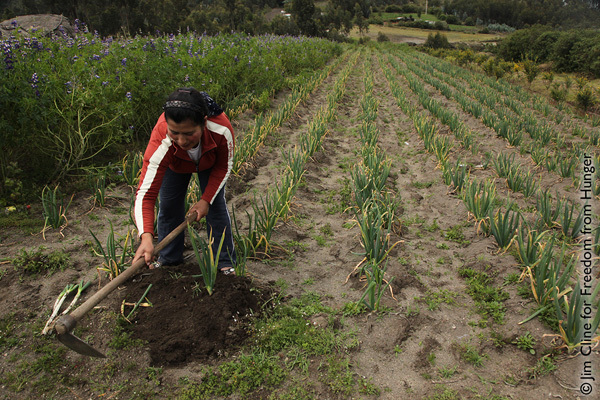 Freedom from Hunger works with local partners in 23 countries in Arica, Asia, and Latin America. LEARN more about Freedom from Hunger’s work here. DONATE directly to support jobs and education at Freedom from Hunger, here.